We'll Bring the House Down is Slade's ninth studio album, released by Cheapskate Records on 13 March 1981 and produced by Slade (except "My Baby's Got It" by Chas Chandler). The album reached No. 25 in the UK and remained in the charts for four weeks. We'll Bring the House Down was the first studio album released by the band after their successful appearance at the 1980 Reading Festival. In order to capitalise on their revival, Slade quickly compiled this new album, made up of some new tracks and some recycled ones, mainly from their failed Return to Base album of 1979. Since their return from the US in late 1976, Slade had struggled to achieve much chart action in the UK. Regardless, the band continued to record and tour. Their 1977 theatre tour, which followed the unsuccessful Whatever Happened to Slade album, saw a drop in audience numbers. The band found themselves playing small gigs after that, including universities and clubs. The band's tours often ran at a loss, bringing their own PA and lightshow, while the band's new material, released through manager Chas Chandler's Barn Records sold little. After the commercial failure of their May 1980 extended play Six of the Best, the band were on the verge of splitting up. However, their fortunes changed when they were offered a headlining slot at the Reading festival in August 1980, following a late cancellation by Ozzy Osbourne. The band's performance in front of the 65,000-strong crowd saw Slade back in the public eye. The music press began to take an interest in the band again, while heavy metal followers also began deeming the band 'cool'. In September, the band released the extended play Alive at Reading, which featured three songs recorded at the festival. It reached No. 44, giving the band their first chart action in years. The band's former label Polydor did not take long to jump on the band's new-found success either, releasing the compilation Slade Smashes! in November. It reached No. 21 and soon achieved Gold status in December for selling over 200,000 copies. 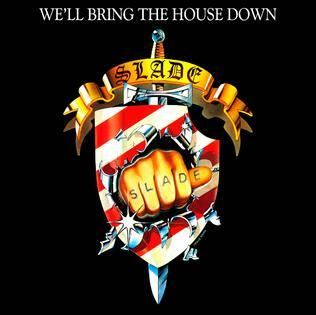 In January 1981, Slade released the single "We'll Bring the House Down" which reached No. 10 in the UK. In March, the album of the same name was released, reached No. 25. The album helped maintain the band's momentum, while they were also able to start playing in larger venues once again. A second single, "Wheels Ain't Coming Down", was also released in March, reaching No. 60. Shortly before the album's release, Dave Hill explained in a fan club interview why the album mainly used tracks that had already been released: "Obviously a lot of the fans that have bought Return to Base, Six of the Best and one or two other things - they are going to have a lot of this material. But it is a compilation LP of a lot of the material that we have recorded over the last 18 months, which as the fans know, the majority of the public have never even heard. It's really for the benefit of the new fans that are coming along and who are in the fan club and have none of the old material. It won't be the same as Return to Base as it will have a lot of the tracks pulled out and other numbers such as "Dizzy Mamma" and "Night starvation" and "When I'm Dancin' I Ain't Fightin'" added, making up a more rocky album. It will basically consist of the live act at the moment, so anyone who's into the live act should like the album. But for the benefit of the old fans, new material is in the pipeline. After this tour we shall be making a new single and a new album." The album's sleeve featured a new Slade logo designed by Chandler. According to the band, the 'fist' bursting through the shield on the sleeve was to signify "four royal bastards". Daily Star wrote of the album: "Their new album is in the same old Slade style - thumping, no-nonsense, high-decibel rock." Record Mirror stated: "It's difficult to justify a record like this on its own terms. Slade are essentially a live act and on vinyl the vital ingredient of spilt beer is sorely missed. But all things considered the pros outweigh the cons, a point which is unlikely to escape the attention of the fans who've put them back in the singles chart." Sounds commented: "Ten tracks of rejuvenated roguery guaranteed to cause severe structural damage to the sturdiest of dwellings and delight the most surly of yobs. We'll Bring The House Down is both a monumental triumph for the band who over the last few months have swept spectacularly back into favour, and a real treat for those kids who've moved unreservedly behind 'em. It is, in short, a corker, brimming with a knowing confidence and expertise that has far from withered through age. We'll Bring the House Down is, when all's said and done, an invaluable addition to the realms of demolition rock. Slade are back with a vengeance!" Melody Maker wrote: "This album fulfils a function. No more. The title track has already put them back in the charts after that long, miserable absence, but they've come up with at least four far better tracks to ensure the stay won't be shortlived - "Lemme Love Into Ya", "Night Starvation", "When I'm Dancin' I Ain't Fightin'", and "Wheels Ain't Coming Down"." Daily Mirror stated: "They were always the loudest. But five years after Slade were written off, they have proved they are a band that can last. And once again Noddy Holder and his boys are bringing the house down with their brash, basic brand of rock. Their new album is in the same old Slade style - thumping, no-nonsense, high-decibel rock." London Trax said: "Overlooking the horrific, infantile, metallist symbolism of its sleeve, We'll Bring the House Down is somewhat surprisingly a bit of a cracker. Of course, very little has changed, which is just how it should be. Potential singles abound. To sum up, Slade have released a great pop record and have more than adequately recaptured the territory left open, since their untimely demise. They have resurrected the legend without smothering it." Smash Hits commented: "Slade were always a great energetic live band but it was their sense of melody that put their hit singles head and shoulders above everybody else. Their present success unfortunately owes more to the dreaded Heavy Metal revival than anything else, and their natural pop sensibility gets drowned amid a sea of wailing guitar solos. They sound as raw and live as ever and Noddy Holder still has a unique set of vocal chords but play this next to their "Greatest Hits" and there really is no competition. They can do better than this." Geoff Ginsberg of AllMusic retrospectively stated: "Slade made a powerful statement with We'll Bring the House Down: "We're back." What the band did was to take the best five songs from Return to Base and mix them in with great new material for a killer album that wouldn't take forever to make. Simple logic will tell you that when you get rid of the worst songs and replace them with great songs, the album's gonna be a lot better. Such is the case here." Joe Geesin of the webzine Get Ready to Rock! commented: "The album combined some of the rockier tracks from the long overlooked/forgotten 1979 album Return to Base with some new numbers. A mixture of metal, rock 'n' roll and new wave pop that worked remarkably well." In 2010, Classic Rock considered the album "superior: reputation cementing" and wrote: "Slade's ninth studio album brought their wilderness years to a close. We'll Bring the House Down was cobbled together quickly after the band's Reading triumph, largely from the contents of their previous (overlooked) album, Return to Base, but "When I'm Dancin' I ain't Fightin'", "Dizzy Mama" and "Wheels ain't Coming Down" cleverly transported the band's live show into the living room, also endearing them to the mushrooming New Wave of British Heavy Metal movement." "We'll Bring the House Down" was Slade's first hit single since 1977. Described by AllMusic as an "absolute must-hear", the idea for the song came to Lea when the band were performing in Amsterdam. The audience kept repeating the chant heard in the song, and Lea, downstairs in the dressing room, realised the potential of it. "Night Starvation" originally appeared on Six of the Best and was also released as a promotional single in the UK during 1980. "Wheels Ain't Coming Down" tells the real-life story of a near-death flying experience suffered by Holder and Lea when travelling to Los Angeles. "Hold on to Your Hats", taken from Return to Base, uses backward reverb effects. "When I'm Dancin' I Ain't Fightin'", taken from Six of the Best, has been described by AllMusic as "pure classic Slade". "Dizzy Mamma" was originally the B-side to the 1979 failed single "Ginny, Ginny". It became part of the band's live set and was for some time, the stage opener. For its inclusion on We'll Bring the House Down, the song was remixed by the band at Portland Studios, along with a second track, "Nuts Bolts and Screws", which was taken from Return to Base. "My Baby's Got It" is rock 'n' roll track from Return to Base. "Lemme Love into Ya" is a minor-key ballad, taken from Return to Base. The song was later re-worked into the song "Poland", which Lea recorded as a solo venture under The Dummies. His version was released as a single under the pseudonym Greenfields of Tong in 1982 on Speed Records. "I'm a Rocker" is a cover of the Chuck Berry track and also taken from Return to Base.